Lest you think it’s all root veggies and greens around here, I present to you the quickest and one of the most satisfying cookies I know. Actually last Saturday was the first time ever that I taught a class and sent people home without a treat. These are cook-with-what-you-have cookies that I vary each time. Sometimes I use whole-wheat pastry flour, sometimes spelt or sometimes just all-purpose. Around the holidays I use golden raisins and candied orange peel but sometimes it’s dried cherries or apricots. I even vary the amounts of cocoa a bit. And sometimes I stir a few tablespoons of orange marmalade or other jam instead of the dried fruit. So if you have 20 minutes (that includes the baking time!) and some cocoa on hand and a few other pantry basics you can have your chocolate/cookie fix or a gift in no time. 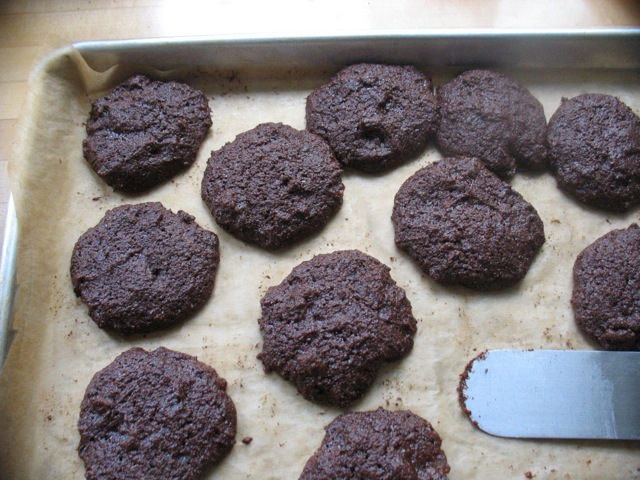 You mix these incredibly easy, fudgy cookies right in the saucepan. Preheat oven to 350°. Combine flour, soda, and salt and set aside. Melt butter in a large saucepan over medium heat. 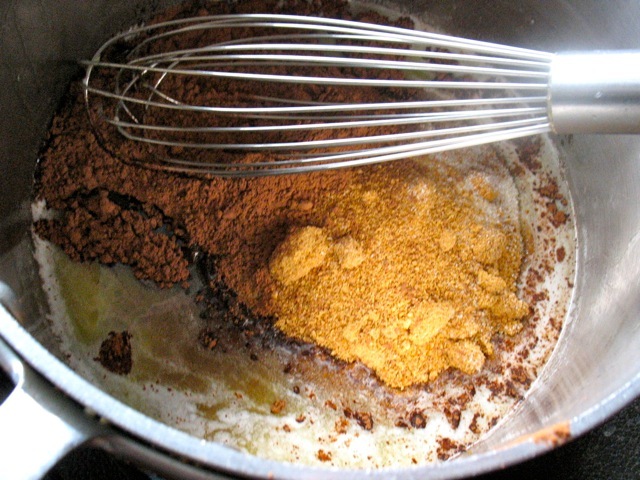 Remove from heat; stir in cocoa powder and sugars. Add yogurt and vanilla, stirring to combine. Add flour mixture, stirring until just mixed. Add any dried, fruit nuts, and/or jam. If adding jam just gently swirl it through the batter, don’t evenly mix it in or it will get a bit lost in the final cookies. 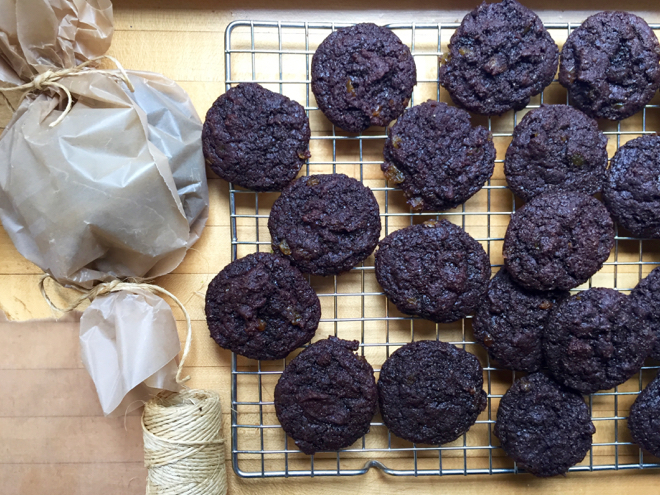 Drop by level tablespoons 1 inch apart onto baking sheets or use a #40 cookies scoop (3/4 oz). Bake for 8 to 10 minutes or until almost set. Don’t over bake and err on the side of underdone, if you like moist, chewy cookies that is. They will firm up as they cool. Cool on pans 2 to 3 minutes or until firm. Remove cookies from pans; cool on wire racks. Kissin’ Wears Out, Cookin’ Don’t! Could you substitute a soy or nut “yogurt” for the dairy yogurt in this recipe? Yes, absolutely. And report back if you think of it! Twas all you promised they be!